Who will the Flyers pick with each of their two first-round picks this year? 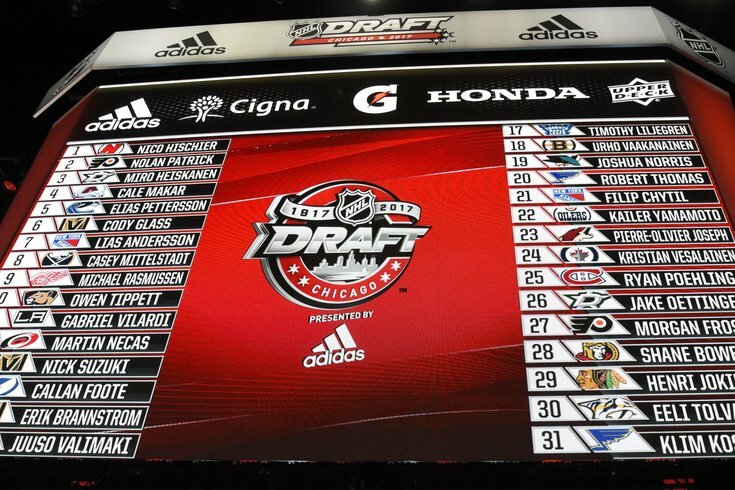 The 2018 NHL Draft kicks off on Friday with the first round, and just like last year, the Flyers will have a pair of picks on opening night. They'll back that up with seven more picks on Saturday. In 2017, Ron Hextall and Co. were lucky enough to land the second-overall pick — that turned into Nolan Patrick — and then pick again at 27th overall. This time around, they're more or less splitting the difference, with their first pick of the night coming at No. 14 overall, followed by a second pick just five spots later (19th overall). So what do we have in Kupari? We have perhaps one of the five best players in this draft in overall offensive skill. He has quick hands and can change the angle in the blink of an eye making a goaltender’s job extremely difficult. He has a rocket of a shot and isn’t afraid to fire from anywhere. When he has the puck on his stick, he’s very aggressive in attacking the middle. Ty Smith’s greatest attribute is without a doubt, his hockey IQ. Smith has a knack for seeing plays develop and finding the open man, or taking the perfect angle on an attacking forward in the corner. He is, in my opinion, the best draft prospect that no one is really talking about. Merkley just finished up his second season with Guelph, which selected him with the No. 1 pick in the 2016 OHL draft as a no-brainer. In his first OHL season, Merkley scored 12 goals and 55 points in 62 games. This season, the righty netted 13 markers and 67 points in 63 games. The offensive numbers are gaudy as they were in Triple-A midget hockey when he was “heads and shoulders above everybody else.” Merkley is an elite offensive defenseman prospect with major concerns in his own end and has been labeled as a player who cheats a bit to produce offense. Plus/minus is a flawed stat but in two seasons in the OHL, Merkley is a minus-70. That’s telling. In 2017-18, he played 22 games with the U.S. National Team Development Program Juniors and another 58 games with the U.S. U18 team. With the juniors, he tallied 4 goals and 16 points in those 22 games – adding another 9 goals and 29 points in 58 games with the U18 team.